Designer TLC Down There - By Mr Smith Underwear! It was about time we got a designer shop of our own for swimmies and smalls. Personally, I can't see past Aussiebum swim trunks, and HOM undies fit me like a glove. Preferring a little support for the crown jewels, there's something about the cut of HOM hipsters that's just right. Sorry this photo isn't very good. I took it on the Mardi Gras day of the West End Festival. When I saw the sign, I thought it said "face panting" at Mr Smith... couldn't think what the hell was going on! 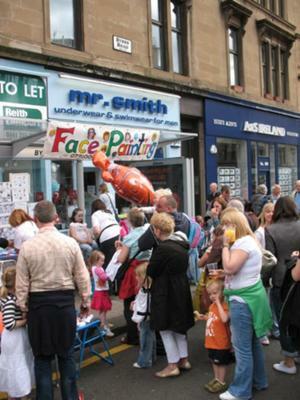 Anyway, it shows Mr Smith in the thick of things on Byres Road, sort of! Comments for Designer TLC Down There - By Mr Smith Underwear! Mr Smith is stuffed full of the best brands in underwear - many of the biggies and many smaller ones difficult to find in UK. They are all TOP quality and very reasonable prices. And if you join their "Underpoints" loyalty club, it's even cheaper - 10% off plus points towards freebies. The staff are lovely too. That's so funny! Glad to hear he wasn't offended... I like their friendly, no-nonsense service too. They seem to know their stuff, which helps when there is so much to choose from. The way they lay everything out is cool too. The mix of hangers and glass topped cabinets keeps it all just where you need it. I got my boyfriend a pair of those Aussiebum pants! I knew he wanted a pair but was too big a scardie to ask - just like you! Anyhoo, he says they're dead comfy, and they give him a bit of extra confidence... Not that he needs it, as far as I'm concerned! Couldn't agree more about Mr Smith. How about those Aussiebum undies that have some 'enhancing' pouches. I think they stuff things forwards and upwards - kinda like a wonderbra for your nether bits! I've been too embarrassed to ask about them. Which is daft, 'cos they're really friendly. You get great service, and they're dead down to earth. Join in and write your own page! It's easy to do. How? Simply click here to return to mr-smith.